A reading of Poison Panic by Helen Barrell. Click here to see the promo video! 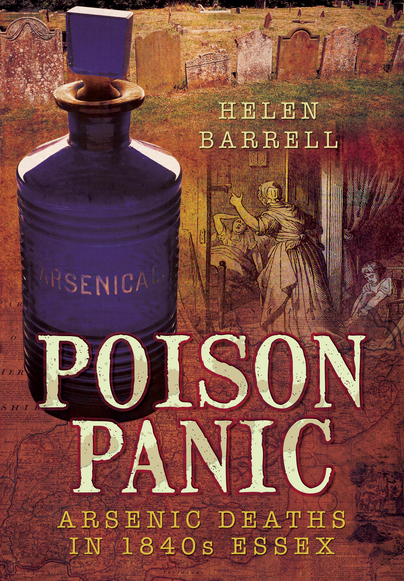 Helen Barrell writes an article for Historic-UK about her book 'Poison Panic' read it here. Listen out for Helen Barrell appearing on Saturday, 6 August's episode of Punt PI airing at 10:30am on BBC Radio 4. As featured in the East Anglian Daily Times : Was Spratty Watts bumped off by an Essex poisoner? You'll be £14.99 closer to your next £10.00 credit when you purchase Poison Panic. What's this? Essex in the 1840s was notorious in the Victorian mind, a place where women stalked the winding country lanes searching for their next victim to poison with arsenic. The public were captivated by these stories, where death was down to ‘white powder’ and the evil intentions of the human heart. Poison was easy to buy, but with the dawning of forensic science and the creation of professional police forces, murderers would not escape justice. Sarah Chesham, Mary May and Hannah Southgate are the protagonists of this tale, of how rural Essex, in a country saturated with arsenic, was touched by the tumultuous 1840s. But were these women murderers or victims of circumstance? Contemporary newspaper, census returns, parish registers, wills, home office documents and the Old Bailey proceedings are the main sources of the author's research and there are comprehensive references to the text and a useful bibliography. Will appeal to readers interested in gaining an insight into the lives of women accused of murder in the mid 19th century. Moreover the index is peppered with personal names for the family historian to peruse. Highly readable and extensively researched, Poison Panic is an extremely engaging book. If you’re looking for a Christmas gift for someone who’s a true crime fan, or if you just fancy a good book to curl up with and want to feel like you’re learning stuff (because this is actual HISTORY, it’s educational) then I really recommend this book. It’s not the sort of thing I would normally chose for myself, but I’m so glad it made it off of the “should read” pile. Barrell's meticulous research and eye for detail recreate lurking threats, and these scandalous true stories are as compelling as any crime fiction. Researched using genealogical sources, Poison Panic is an intriguing read that brings a forgotten history to light and reveals past attitudes to women - and a national fear that gripped Victorian Britain. During the 1840s, the eyes of Victorian Britain were turned on Essex where poison, it seemed, was the weapon of choice. On trial for poisoning, Sarah Chesham, Hannah Southgate and Mary May captured the imagination of a country in turmoil. Could Essex really be home to a murderous circle of housewives, hell bent on chaos? Helen Barrell's Poison Panic tells the tale of these three cases that gripped the era leading to suspicion, fear, and a frenzy for murder. Her research uncovered not only skeletons in her own family closet, but some fascinating stories from the days when arsenic seemed to be everywhere. In untangling the twisting tales of the women, Barrell brings them vividly to life, a richly detailed supporting cast springing from the pages. Her meticulous research and eye for detail recreate the lurking threats, and these scandalous true stories are as compelling as any crime fiction. Poison Panic takes the reader on a journey through Victorian Essex that leaves no stone unturned, looking not only at the crimes but also at the wider social context. You can see clearly how gossip soon became accepted as fact and how innocence was quickly lost. This book will fascinate not only historians of true crime and those with an interest in genealogy but any reader seeking a story that would make Agatha Christie proud. Helen Barrell is a good writer who grabs the attention right from the start of her book and holds it throughout. It is difficult to believe these days how easy it used to be to buy poison across the counter in any chemist shop, and the choice of poison was extensive too - prussic acid, strychnine, belladonna, digitalis, and vitriol. Also, the number of deaths from poisoning, be it murder, suicide or accidental, was large and probably larger than the records suggest. As Barrell points out, in the 1840s the newspapers were full of reports of the inquests into deaths known or suspected to be caused by poison. An unexpected death almost always shed the light of suspicion on a relative or a friend, the noose casting its all too real shadow over all. Particularly popular at the time were so-called burial clubs. People paid into these and received a substantial pay-out intended to cover burial costs. Instead they often proved to have provided the motive for murder, and, as Barrell says, easily obtained poisons provide the means. The laws covering the registration of deaths were also particularly lax and it is likely that a lot of poison murders were undetected as a result. Essex in the 1840s developed a particularly bad reputation for poisonings. Barrell looks at three cases, each meticulously researched and set in their social and geographical setting. Sarah Chesham, Mary May and Hannah Southgate were each accused of arsenic poisoning, each standing trial as the newspapers speculated that they were members of a female poisoning ring who rid themselves of brothers, husbands, sons, and anyone else who stood in their way of securing burial club money and/or another romantic partner. Using these three cases, Barrell explores the lives of the people, the wider society, the growing anxieties about the availability of poisons, and the early developments in forensic science. A very well constructed and informative book on a specialist subject. - 5 Stars! ... an interesting story about gender and crime. What a brilliant book! It is so well written and the subject matter so interesting that I felt compelled to read the whole thing in two sittings. The writing style is so engaging and it is very evident that the author has done very thorough research. How fascinating that so many of the historical characters mentioned in this book are relatives of the author herself. I'd highly recommend this book as it gives so much more insight into these famous historical poison murder cases and it makes one wonder how guilty these women really were. I had also never thought about early forensic science before, and learned a lot from this book. ‘Poison Panic’ explores a series of long-forgotten but fascinating real-life cases of arsenic poisoning in 1840s Essex. The background to the cases is clearly explained and well-illustrated, setting the alleged crimes solidly in their geographical and social settings, and with the underlying question of whether these women really were murderers, or victims of circumstances. The stories reveal a mid-Victorian fascination with, and fear of, poisoning, sometimes linked to financial gain through subscriptions to burial clubs. The occurrence of arsenic poisoning in the county of Essex is really quite shocking! The three main cases, which all have different outcomes, are brilliantly re-created through Helen Barrell’s meticulous research. Her style is straightforward and clear, examining the circumstances of each woman, the key events and the subsequent trials. She gives a rich insight into their lives, their relationships and their daily struggles. There are interesting links throughout between the crimes and the local environment, as well as wider society and early developments in forensic science. It is a very readable narrative, which successfully brings the characters back to life, with detailed descriptions, photographs and images. The book is even peppered with the author’s own ancestors, which adds an intriguing personal dimension. ‘Poison Panic’ is a clever mix of family history and true crime. It is an excellent book and a must read for all lovers of historic crime. ... using local and national newspapers, a number of cases from rural Essex are brought together and explored in detail in an interesting way making a satisfactory read not just for the specialist in criminal history but also for the general reader. A huge amount of effort from the author is rewarded by a book that should be widely read by all those interested in the history of the countryside and the lives and histories of so called ordinary people. Helen Barrell is a librarian at the University of Birmingham. She has appeared on BBC Radio 4’s Punt PI, has written for magazines such as Fortean Times and Family Tree, and guest blogs for Findmypast. Her first book, Poison Panic: Arsenic Deaths in 1840s Essex, was published by Pen and Sword in 2016.